Today I'm writing review about CryptoSolutions which was started on 7th Of April 2016 and added to AlexNews on 22th Of July 2017. CryptoSolutions is a “Big budget” HYIP and one of the most popular program right now. I've found a lot of investors has joined there already and many of those were with big amounts. It's look like CryptoSolutions have some factors which is able to attract investors and no doubt that the rally of investors will be continued. I'll try to analyze some 'factors' which are the key points of CryptoSolutions. First of all, the admin of CryptoSolutions have shown their dedication about his program. This program is running from 477 days and investors always have some attraction on old programs. Unlike other old programs CryptoSolutions is still relied on their first investment plan (It has added more plans recently). As the program was started with some popular HYIP Monitors, it will be safe to say that the program is PAYING from 472 days without any scandals. That means CryptoSolutions have paid more than 30 cycles already and still going on. Nowadays, CryptoSolutions is being monitored by almost all popular HYIP Monitors and trusted blogs . They've done a proper advertising and now it's look like more promising than the early ages. This is the big factor that CryptoSolutions is able to attract investors and that's why most of investors has joined very recently. Finally, the design of their website has been changed recently. 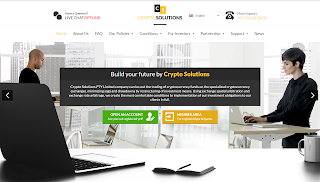 CryptoSolutions was started with the basic template comes with GC script. But they've changed the design just before the big promotional activities started. By the way, the current design looks rich and the website is very well built. A promotional video could be more impressive. As I said, CryptoSolutions was started with one investment plan which is 1.5% daily for 30 days, principal back at the end of the term. There are more plans has been added recently which are 111% to 200% after 7 days, 125% to 500% after 15 days and up to 300% to 3000% after 75 days. There are 2 more VIP and special offers which looks very unpromising and I'd like to ignore those plans. The key plan of CryptoSolutions 1.5% for 30 days which is running from the begging of the program. Min investment is started from $10 for this plan and the maximum is $1000. The net profit is 45% after 30 days which is fairly attractive for medium and big investments. Small investors may choose the second plan which is 111% to 200% after 7 days. My high RCB offer will bring some extra money for you and you'll got a handsome amount from small investments. This plans is also attractive for medium and big investors who don't want to wait for 30 days. Even you'll got 0.5% extra in this plan but there will be no money in hand before 7 days. If you're a big investor then you can try investing a small amount on 3rd plan which will pay 125% to 500% after 15 days. But, I'd like to suggest to ignore all other plans including VIP and special offers. By the way, CryptoSolutions accept PerfectMoney, BitCoin, Payeer and AdvCash for investment and the withdrawal system is 'Manual' and may took up to 24 hours to get processed. CryptoSolutions is based on GoldCoders script which is almost untouched. Using a custom script would be more impressive as many big programs used custom scripts nowadays. Hosting and DDoS protection is taken from Terratransit Ag which is a popular out of the HYIP industry. Extended Validate SSL from COMODO for secure connection and the proof of being a certified company. At last, I'd like to say that the admin of this program have spent his time and money for this program and tried his best to make the program looks promising from every aspects. This is a big program and we all know that most of big program pay for a long time. But, investors should be cautious and keep in mind that nothing is guaranteed in HYIP Industry. So, please invest less than you afford to lose.